Pai gow poker game is based on the Chinese domino game. Pai gow poker can be played against the online dealer or against other human players. Based on the Chinese domino game of the same name, the game can be played either against the dealer or against other human players. The rules are in effect, the same as the domino game, though featuring poker hand combinations. Just one deck is used in pai gow poker, although the game does include jokers, which are used as a wild card. That wild card however, can only be substituted for an ace, or to complete flushes or straights. The dealer deals seven cards to each player, which the players hand divided into two hands of two cards and five cards. The objective is to gather a winning poker combination in the five card hand, whilst the two card hand must contain a pair. No other combinations are acceptable for the two card hand. The trick with pai gow poker is that the five card hand must be of greater value than the two card hand. That being that having a pair in the two card hand is insignificant unless the five card hand contain a two pair or higher. 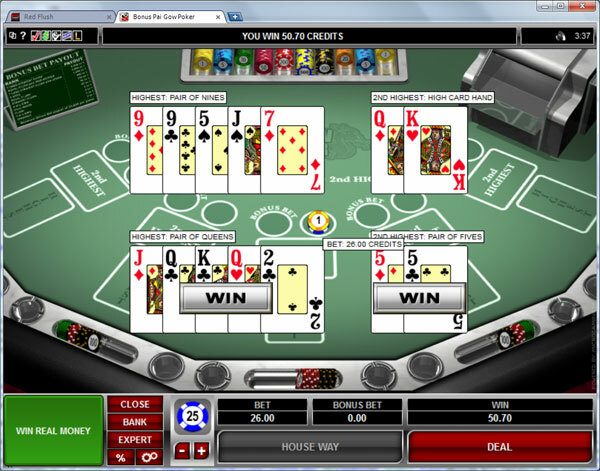 If the dealers wins both hands then the player loses his bet. Should the player and the dealer have a higher hand each, then the bet is returned and the game begins anew. Should the player have two better hands than the dealer, the player wins the stake. In the event of a tie, the dealer wins. Bets must be made during the game, and there are generally no options that enable you to raise your bet. Once a bet has been made, the player must play their hand, and is in for the wager, come hell or high water. There are no real variations of pai gow poker available on the net, and the game itself is only offered in online casinos that have a fine collection of poker or table games on offer. Quite a lot of online poker sites do feature pai gow poker, but like Bermuda poker, and sic bo, this card game can be hard to come by, despite the obvious high house edge that comes with the game.